In this post, you will find the current rules for the use of drones in the Bahamas. To enter the Bahamas with a drone, you must first obtain permission from the Civil Aviation Department, whether you fly privately or commercially. Otherwise, your multicopter will be withheld upon entry. Upon entry, you may have to deposit 50% of the value of the drone as a pledge. Upon departure, you will receive the full amount back. The registration certificate must always be carried. From a take-off weight of 15 kilograms, the copter must be marked. The Bahamas Civil Aviation (BCAA) assigns a badge for such aircrafts. Maximum flight altitude: The maximum permitted altitude in the Bahamas is 120 meters. Maximum horizontal distance and FPV: During flights, it must always be ensured that a person has direct visual contact with the drone. For FPV flights, this task can be taken over by a second person in direct contact with the pilot. Compulsory insurance: In the Bahamas, you must always be able to present evidence of valid aviation liability insurance during a drone flight. Maximum take-off weight (MTOW): Drones up to a weight of 15 kilograms can be flown privately. The CAA must confirm heavier unmanned aerial vehicles (up to a maximum of 25 kilograms). For this, a certificate of airworthiness has to be submitted. Besides, a theoretical and a practical test must be completed. Distance to airports: Flying drones must not approach closer than 8 kilometers to airports. Other safe distances: To persons, a horizontal distance of 50 feet (15 meters) and a vertical distance of 100 feet (30 meters) must be ensured. Flight bans: People are only allowed to fly over if they have given their prior consent. Crowds generally cannot be overflown. Landowners are required to obtain permission if the area is to be overflown. Flight approval: The use of drones in nature reserves is prohibited. So you have to apply for the appropriate permits for these areas. Time of operations: Drone missions at night under the open sky are not permitted. However, there is one exception if the drone flies within 100 meters of structures (buildings, trees, etc.) and deeper than the highest point of these structures. The authorities assume then that a collision with other flying objects can be ruled out. Specific regulations: Not allowed are flights in bad weather conditions. Concretely, this means that the visibility must be more than one mile (1.6 kilometers) and that the cloud edge must be higher than 500 feet (152 meters) above the ground. In fog, the operation of drones is not allowed. Regulations for commercial pilots: Commercial pilots in the Bahamas need an “RPA Operator Certificate.” We were promised that our German permit would be accepted. We have not tried that yet because we do not have a fixed travel date for the Bahamas so far. In addition to the promotion approval, you must provide information about your copter equipment, flight times and ascent grades. Good to know: For all inquiries, you can contact the mail address dronesupport@bcaa.gov.bs. For your copter operations, you must always be able to show your passport or identity card. 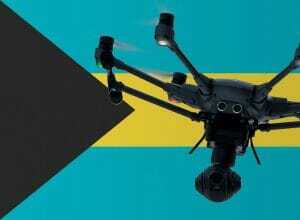 We have researched the listed drone regulations for the Bahamas to the best of our knowledge. We can not guarantee the correctness of the information. If you want to be on the safe side, please contact the competent aviation authority. Alternatively, you can also ask the embassy in your country for further information about the regulations. Please leave us a comment when you receive news and/or gain experience with your copter in the Bahamas! My partner and I are travelling from Australia to the Bahamas. We have a DJI Spark that we are taking. What exactly do i need to do here? Do i need to register it in the Bahamas? If so…how do i do that? I’m just in the planning stages of a trip to Bahamas. I started my application as I was curious if it costs anything for the registration. Do you know if there is a fee? I haven’t heard that a fee applies for the process. What insurance do you use when you fly in the Bahamas? Also, is there a Bahamas version of skyvector.com that would allow me to view the type of airspace and any flight restrictions? If not, do you have any recommendations? We are visiting Grand Bahama on a cruise for the day. Do you know if the cruise security will ask for 50%? I am also planning my vacation to the Bahamas in September. But honestly I am hesitating if I should bring my drone or not. Upon entry there is a chance that you have to pay a deposit for your drone which is 50% of the value . Theoretically you will get it back when you are leaving. BUT it can be only cash… I don’t have to much faith in that you ever get it back. and reading through it. Along with the items noted on this blog, there are several other requirements/restrictions. For example, flight in Class A, B, C, D, E and F airspace is prohibited along with in Danger, Prohibited, Restricted, and Wildlife protection areas. I’m going through through this process now for a training event with the University of the Bahamas.